Furniture designer Rahil Taj’s background in architecture informs his work, resulting in smart pieces that stand out from the pack. 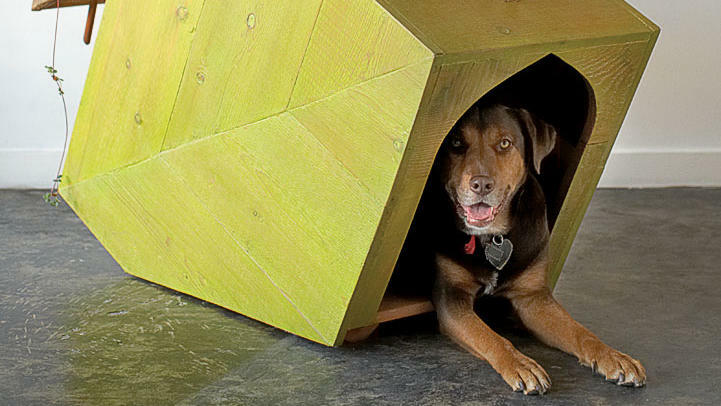 To break apart from the traditional plastic, domed doghouses that dominate the market, he designed a sleek alternative with weather-resistant concrete, powder-coated steel, and Brazilian teak. The perforated panels make it simple to clean, while the casters allow for an easy relocation. Add the built-in feeding bowls, and you can bet this will be your buddy’s favorite spot in the house. MDK9 Dog Haus by Rah:Design. L.A. interior designer Kelly Wearstler is the first person you call for a jaw-dropping home that strikes the balance between edgy and warm. The dog lover’s pet houses are no exception. 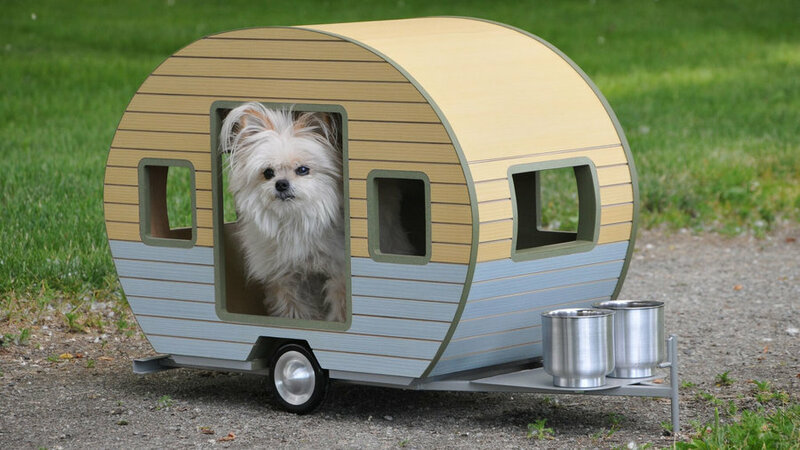 We’re partial to the Douglas fir, barrel-roof style for petite pups; but the gridded ipe model and the darker walnut abode will also please discerning doggies. Avant Dog House by Kelly Wearstler. Full Loft’s eco-friendly, handcrafted crashpad resembles a vintage TV set—perfect for your superstar dawg. The cushion is made of anti-allergic memory foam and covered with a washable and durable sailcloth. The versatile piece (it also makes for a nice table) has a hinge door for cleaning. Nido Home by Full Loft. Husband-wife team Alejandro and Sara Pijuan apply the same standards of home design they learned in architecture school to creating functional and stylish retreats for pets of all sizes. The 1118 Woof Ranch mimics mid-century mod human homes and has an astroturf deck that is partially covered and naturally ventilated. A roofline ridge recycles rainwater into a decorative planter. 1118 Woof Ranch by PD Workshop. 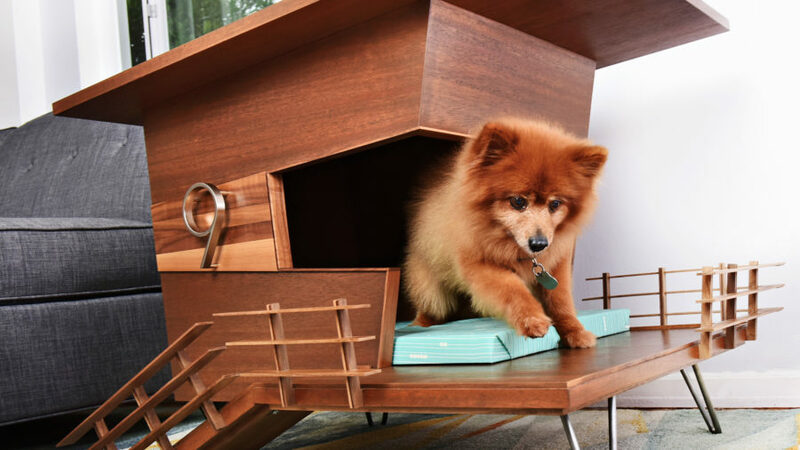 Inspired by their location in L.A.’s lifeguard stand-studded South Bay, the Pijuan Design Workshop team dreamed up this end table-doghouse hybrid. The low-slung deck and ramp makes it accessible for small or aging pups, while still allowing them the feeling of being elevated. It’s a weighty piece with a solid core and real wood veneer that will last for years. Dog Tower 9 by PD Workshop. No yard, no problem! 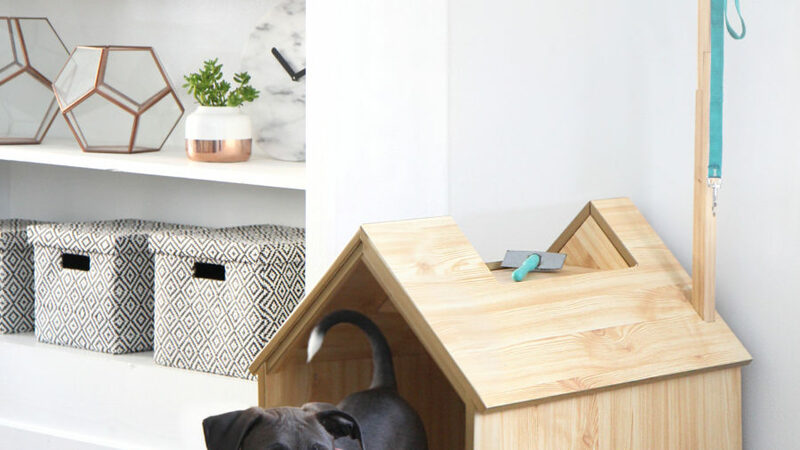 This compact doghouse was built for indoor use, and it comfortably fits medium-sized pooches. 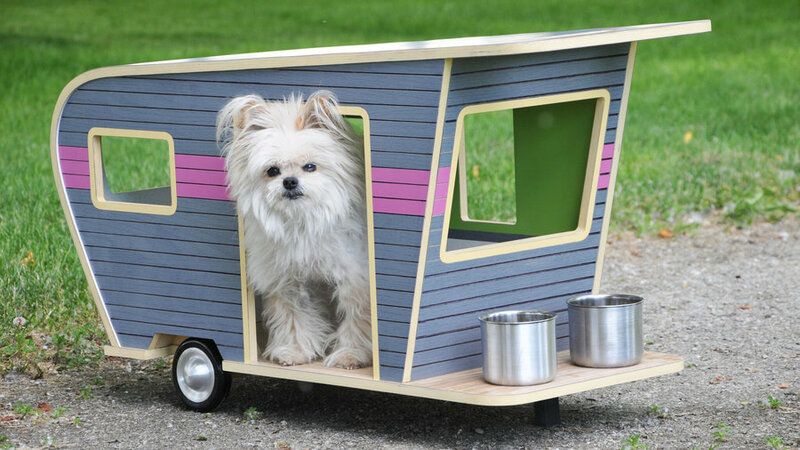 It looks like a classic, but offers so much more with an attached food and drink station, a shelf on the roof for treats and grooming supplies, and a tree for hanging leashes. The cozy bed also has removable fabric that you can throw in the wash. Inside Dog House by Sauder. A little zen goes a long way when it comes to creating a dreamy abode for your pooch. 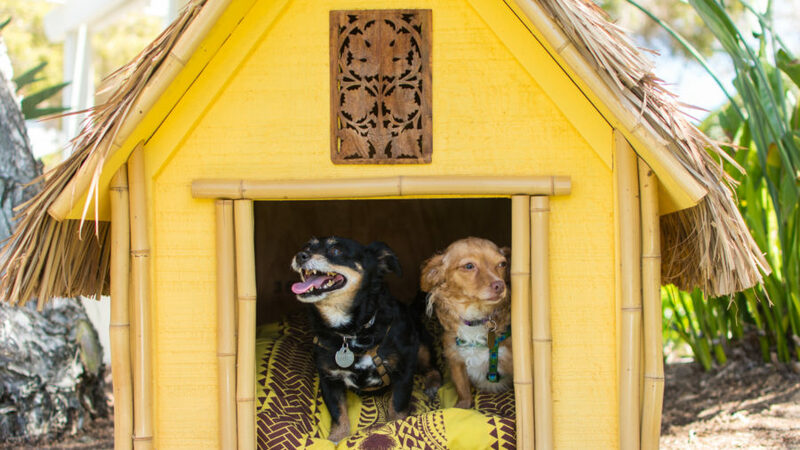 The owners of Designer Dog Houses pulled from their Newport, California, neighborhood and the laid-back appeal of Asian beach towns to make this thatched-roof shack. Bamboo accents and a papaya hue add to the tropical vibe. The Indo House by Designer Dog Houses. 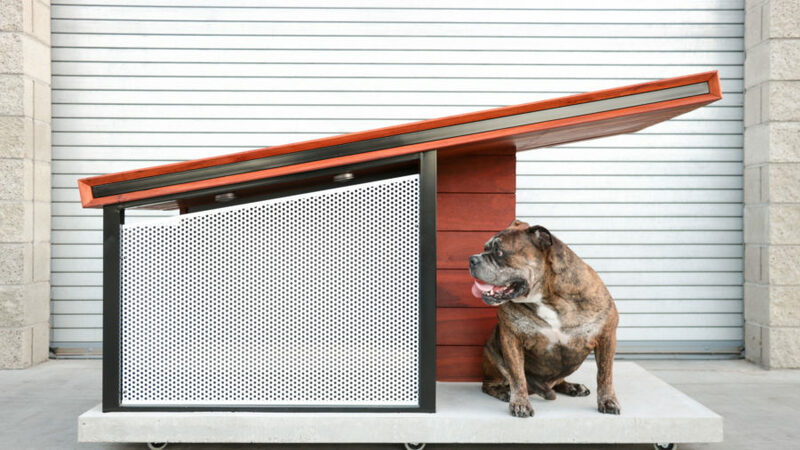 Bad Marlon Design Studio looked to urban cities to inspire its minimalist doghouse with sweet cutouts that let natural light filter through. The pod is made of powder-coated steel, so it can live inside or out. Oshu House by Bad Marlon Design Studio. 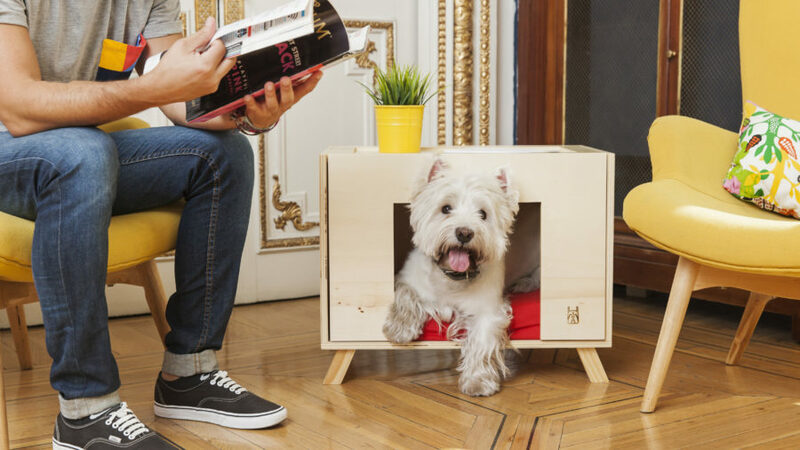 Upgrade royal hounds to a mini McMansion reminiscent of your first playhouse. Rockstar Puppy Boutique’s version works double-duty with a doghouse and kennel wrapped into one. There’s also a dutch door on the side for human access. 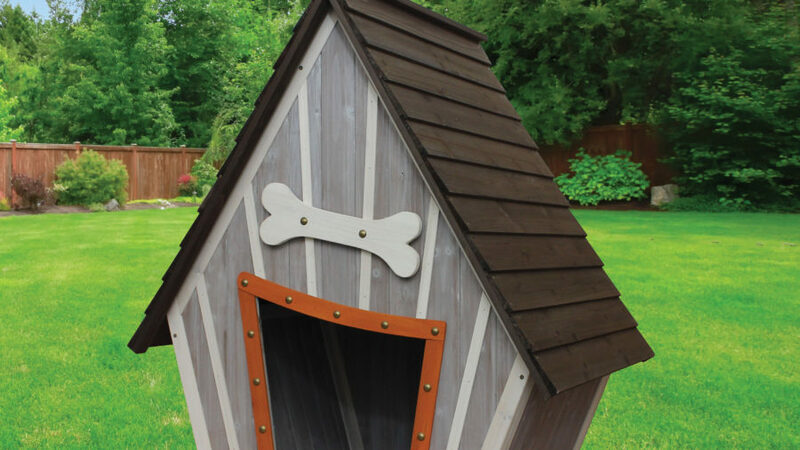 Cape Cod Kennel Dog House by Rockstar Puppy Boutique. 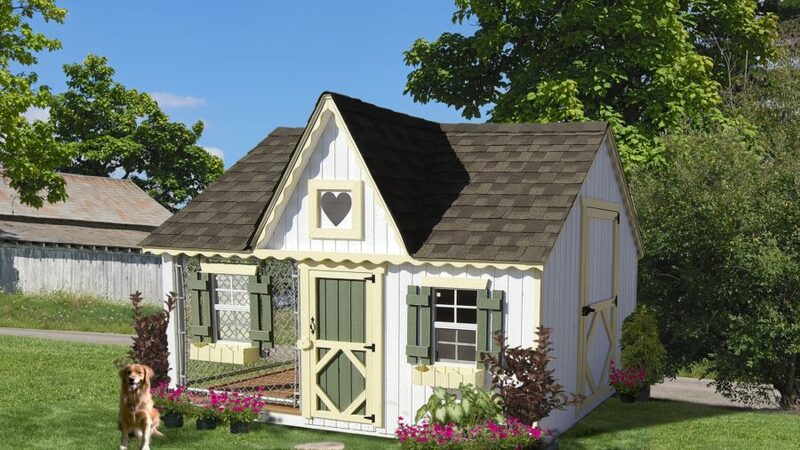 A simple gable roof-house is updated with a slightly uneven pitch, angled stripes, and an asymmetrical door. The storybook-worthy charmer is best suited for toy dogs. 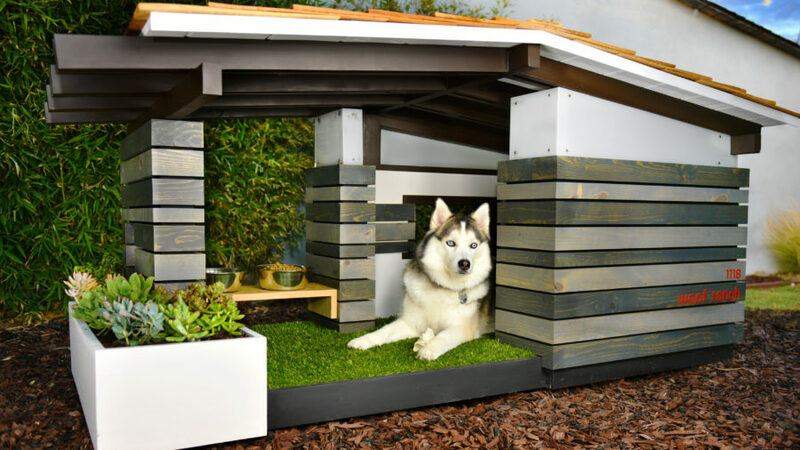 Houses & Paws Whimsical Dog House by Innovation Pet. This model of 2 CUTE in patriotic colors was inspired by the boxy permanent trailers in trailer parks. Trailers are made out of recyclable aluminum, plywood, and plastic. 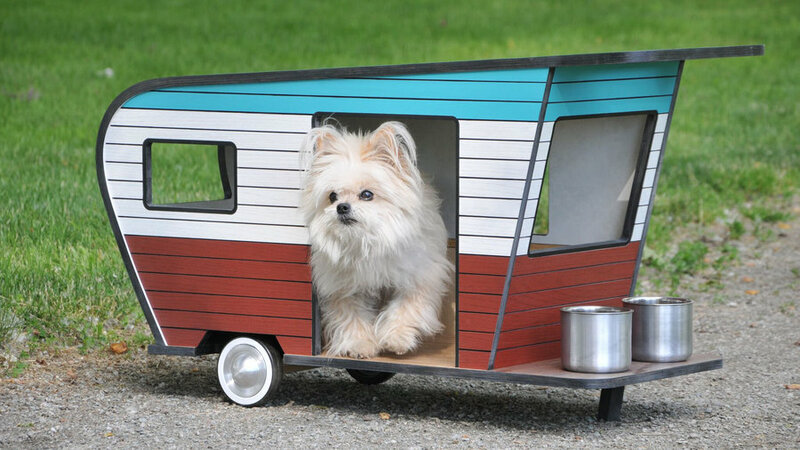 Pet trailer by Judson Beaumont and Straight Line Designs. Designer Judson Beaumont calls this one CAT NAP, and it was inspired by the shape of shape of Mickey's trailer in the 1938 short film Mickey's Trailer. Pet trailer by Judson Beaumont and Straight Line Designs. 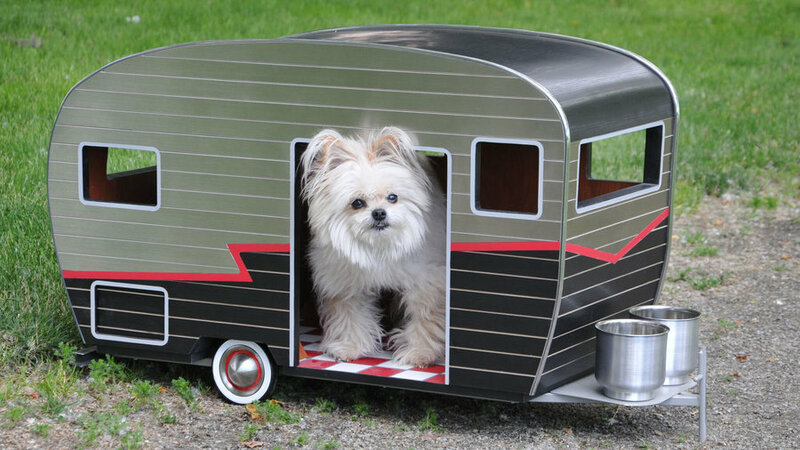 These pet trailers are fully customizable, from wall colors, and flooring, and even a personalized license plate. Seen here—RUFF N IT, inspired by the 1950’s Shasta profile. 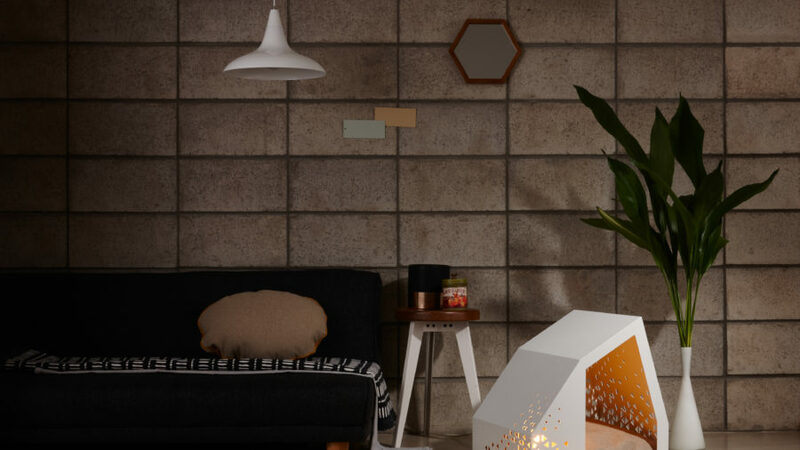 You can even add interior lighting and wireless speakers. Pet trailer by Judson Beaumont and Straight Line Designs. 2 CUTE in dark gray and pink takes us back a few decades, combining modern design, functionality, and a hefty dose of nostalgia. Pet trailer by Judson Beaumont and Straight Line Designs.